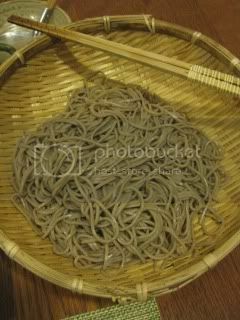 On New Year's Eve, we eat soba noodles ("toshikoshi soba") in Japan to pray for longevity. I've been carrying the tradition since I moved to LA. For me, the best way to spend New Year's Eve is to eat "toshikoshi soba", drink nice wine or sake, and relax at home with family after doing prep work for a celebration meal on New Year's Day. 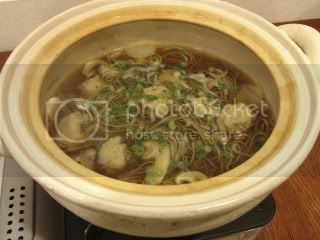 This year, our "toshikoshi soba" dinner menu was made around donabe steamer, "Mushi Nabe". I made 3-course dinner with this one donabe. 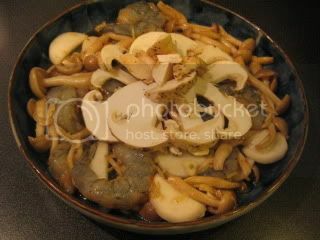 To make the meal more special, I used a lot of matsutake mushrooms which we brought back from Napa/ Sonoma trip. First course was a donabe steaming dish. I got half pound of shrimp, so I kind of played around with it to create a new dish. The secret ingredient is my homemade kochujang (Korean-style hot bean paste), which I made with my homemade miso, hatcho miso, etc. 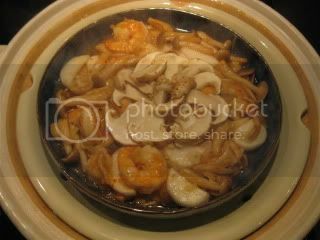 I made a sauce by mixing sake, soy sauce, oyster sauce, kochujang, etc., and mixed shrimp, sliced Japanese turnip ("kabu"), shimeji mushrooms, sliced ginger and garlic in the sauce. Then, I added a tablespoon of potato starch ("katakuriko") and mixed again. 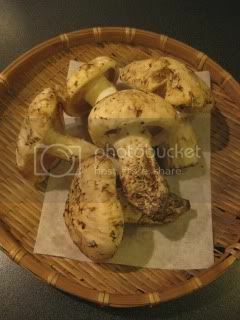 The ingredients were put in a plate and sliced matsutake mushrooms were arranged on the top. 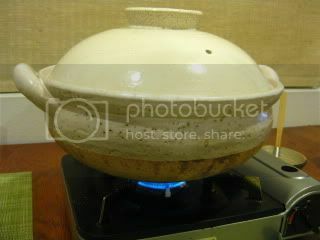 The plate was put in the donabe steamer, "Mushi Nabe", which was filled with dashi stock, and steamed for about 10 minutes. The dish came out really tasty! 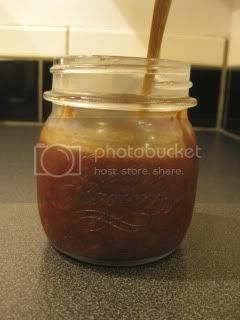 I didn't take notes of all the ingredients' amounts, so I will do so next time, and I can post the full recipe, then. 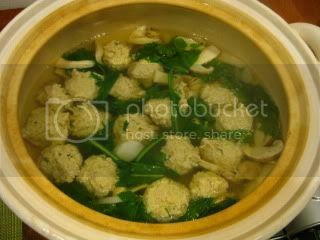 The second course was simple yet gorgeous chicken meat balls ("tsukune") and matsutake mushroom hot pot. 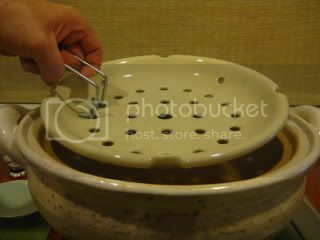 First, we removed the steam grate from the donabe steamer, "Mushi Nabe". 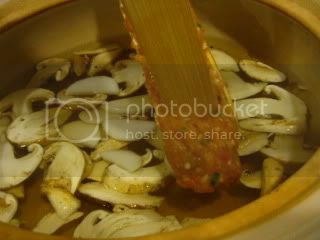 Since there was already dashi stock in it, Matsutake mushrooms, kabu (both sliced), and chicken meat balls were added and simmered until everything was cooked through. 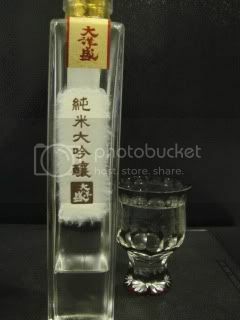 At the end, kabu leaves were added and the second course was ready. The aroma was so fantastic. So much matsutake mushrooms! We enjoyed these ingredients with homemade ponzu sauce and other condiments. So nice. The final "shime" douse was soba noodles! 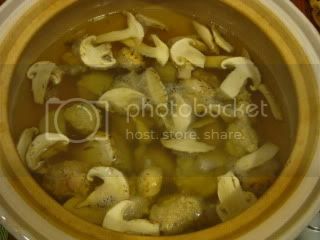 The stock in the donabe has become so much richer because it was further infused with chicken and matsutake mushrooms. To make the broth for the soba noodles, I seasoned the stock (about 1L was remaining) with 2T sake, 3T mirin, 2T soy sauce, and 2T light color soy sauce ("usukuchi shoyu"). 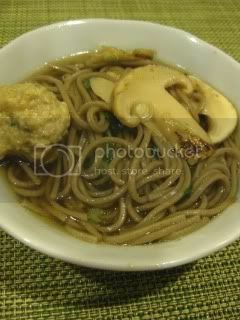 I pre-cooked the soba noodles to al dente and just added to the simmering broth and cooked for 1 minute. The gorgeous soba with the super broth was ready. Wow, it was so good that I wished I could have soba in this matsutake broth all the time! 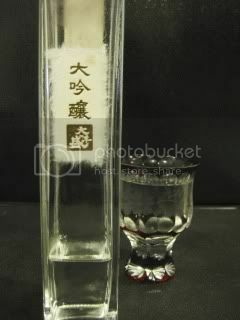 To make the evening more special, we had special Daiginjo and Junmai Daiginjo sake by Taiyo Zakari (大陽盛) in Niigata, gifts from my sister and her husband in Japan. Delicious New Year's Eve.